When Lyme disease and the various coinfections that come with it (MSIDS or multi infectious disease syndrome) affect the brain it is often called Lyme neuroborreliosis or Lyme encephalopathy. It can mimic any psychiatric disorder and is often compared to neurosyphilis, with symptoms capable of lying dormant for years only to surface at an opportune time. These symptoms can be so crippling that a patient won’t leave the house. Sufferers may lose intimacy with friends and family due to misunderstood rage, depression,depersonalization, anxiety, hallucinations, and other severe cognitive impairment, including memory loss. Many are extremely sensitive to light, sound, and scents, making them prisoners in their own home. One-third of psychiatric inpatients showed signs of a Borrelia infection according to Holdorf Medical Group based on a 2002 published study in the Journal of Psychiatry. The severest behavioral symptoms were reversed or improved with proper treatment, but not psychiatric medications alone. Disorders of the nervous system have been found in 15-40% of late stage Lyme patients (Caliendo et al, Psychosomatics 1995;36:69-74). http://danielcameronmd.com/16-year-old-boy-lyme-disease-presenting-depression/ Here a 16 year old boy suffered from a myriad of symptoms including depression. After being diagnosed clinically for LD he was put on 12 weeks of IV Ceftriaxone and improved in sleep, appetite, headaches, joint pain, numbness, distractibility, short-term memory, and emotional behavior. Depression cleared without antidepressants and his IQ improved by 22 points and school performance improved. http://www.bio.davidson.edu/people/sosarafova/assets/bio307/meprasse/page07.html Although the typical literature states that there are 3 stages of disease in a certain order, it’s important to remember that some patients only go through one stage while others experience all three. Some may only go through stage 3 or late stage, which may include some of the more frightening psychological aspects. LLMD, Dr. Horowtiz, goes on record stating that antibiotics are effective in Schizophrenia. With irony he points out that the authors attribute the reason minocycline helped these patients is due to its ability to affect glutamate pathways in the CNS, blocking nitric oxide-induced neurotoxicity, and inflammation in the brain. He reminds them that minocycline is a tetracycline antibiotic that very well may be treating an infection. He also emphatically states that he has had several schizophrenic patients test positive for Bb, the agent of Lyme Disease. After taking doxycycline they improved significantly and with the help of their psychiatrist, were able to reduce and in some cases eliminate all of their antipsychotic medication. It is important to note that patients remained stable on antibiotics but their symptoms returned if they stopped treatment. He says a doctor should suspect MSIDS in psychiatric patients if they have a symptom complex that has good and bad days with associated fevers, sweats and chills, fatigue, migratory joint and muscle pain, migratory neuralgias with tingling, numbness and burning sensations, a stiff neck and headache, memory and concentration problems, sleep disorders with associated psychiatric symptoms. Horowtiz also reports the work of psychiatrist Dr. Brian Fallon who has linked Lyme Disease to paranoia, thought disorders, delusions with psychosis, schizophrenia, with or without visual, auditory or olfactory hallucinations, depression, panic attacks and anxiety, obsessive compulsive disorder, anorexia, mood lability with violent outbursts, mania, personality changes, catatonia, dementia, atypical bipolar disorder, depersonalization/derealization, conversion disorders, somatization disorders, atypical psychoses, schizoaffective disorder and intermittent explosive disorders. In children and adolescents MSIDS can mimic Specific or Pervasive Developmental Delays, Attention-Deficit Disorder (Inattentive subtype), oppositional defiant disorder and mood disorders, obsessive compulsive disorder, anorexia, Tourette’s syndrome, and pseudo-psychotic disorders. Children suffer horrendously as often they can not adequately communicate what they are going through. https://wordpress.com/post/madisonarealymesupportgroup.com/2008 A harrowing story of a little girl who was told by doctors she made up all her symptoms. The parents were told to ignore her physical complaints. They gave her strong immunosuppressants which exacerbated her symptoms. The mother found a Lyme literate doctor who is also an expert in PANS/PANDAS. She tested CDC positive for Lyme, positive for Babesia, Bartonella, Erlichia, and Mycoplasma, as well as PANS/PANDAS. http://mentalhealthandillness.com/tnaold.html Psychiatrist Dr. Bransfield also has noticed patterns emerging after interviewing hundreds of patients. He estimates that aggressive behavior has been a significant issue for some, although many more have reported associated symptoms. He notes that aggression may only be present for a phase of the illness. “In considering the behavioral symptoms, these patients can become suddenly suicidal with completed suicides attributed to Lyme disease. Homicidal ideation, urges, and behavior occur in some of these patients. Some adult patients describe struggling to not act on these urges. When these patients act on a homicidal urge, more commonly it is a child becoming assaultive to a sibling. Dissociative episodes sometimes occur with these patients occasionally accompanied with aggressive behavior and loss of memory. Compensatory compulsions are common in an effort to compensate for the memory deficits. NPLD (neuropsychiatic lyme disease) can imitate a number of common psychiatric syndromes. It can be difficult to differentiate Lyme disease from rapid cycling Bipolar illness or Post-traumatic Stress Disorder. Eating disorders are common. Invariably these patients either gain or lose weight. Sometimes massive weight gain is also seen. What is truly concerning is a recent CDC report dissuades the use if IV antibiotics for Lyme Disease. https://madisonarealymesupportgroup.com/2017/06/23/no-bias-in-mmwr-for-any-other-infectious-disease-requiring-iv-antibiotics-except-for-lyme/ These people misdiagnosed with Parkinson’s or Alzheimer’s may not be able to get IV antibiotics due to this report which was meant to frighten doctors and keep insurance companies from having to pay for it. *When the two above are mild they can be irritable. http://www.igenex.com/psychological_effects.htm Can a tick bite drive you crazy? “A recent European study shows that psychiatric in-patients are nearly twice as likely as the average population to test positive for Lyme. 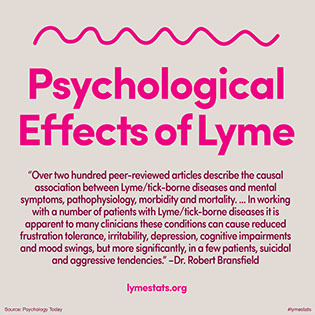 Psychiatric Lyme has been linked with virtually every psychiatric diagnosis and can affect people of all ages and from every walk of life. A former honor roll student is diagnosed with Attention Deficit Disorder and pegged as a “problem kid” because he can’t sit still in class. A lawyer has to close her practice because she can’t concentrate and suffers from anxiety attacks. A young mother is so sensitive to noise that she can no longer tolerate her baby’s cry and is afraid that she will harm her child. A retired salesman develops a compulsive habit of writing all over everything—he covers everything from the tablecloth to matchbooks with meaningless scribbles. Family members are baffled by these transformations; counselors and physicians are consulted, often to no avail. While these individuals may also have migrating muscles pain, headaches and problems with their joints—common signs of Lyme—these symptoms are rarely picked up in a mental health evaluation. And when traditional psychiatric medication fails to produce a cure, the patient grows more desperate. ‘Most people come to see me because they’ve got something wrong that nobody else can figure out,’ says Debra Solomon, MD, a psychiatrist who practices in North Kingston, RI. Fifteen years ago Solomon was confronted with a medical mystery. More and more patients were coming in with the same group of symptoms—fatigue, headaches, migrating joint and muscle pain, accompanied by anxiety, depression, and memory problems. When one of her patients turned out to have Lyme disease, she tested the others, and found that nearly all were positive. • A college student in her early twenties who started hearing voices. “She came from a good family and had no previous emotional problems,” says Solomon. How can a physician tell the difference between true mental illness and symptoms linked to Lyme disease? With Lyme disease, a patient’s psychiatric symptoms don’t quite fit the textbook definition. There is usually no previous history of psychiatric illness. Symptoms often come in cycles. Patients usually do not respond well to psychiatric medication. And they often describe their problems in very physical terms. Lyme patients often say, ‘There’s a wall in my brain and I can’t seem to move my thoughts from the back to the front.’ ‘This arises from encephalopathy, an inflammation in the brain that affects cognitive function,’ Solomon explains. Symptoms often worsen as the Lyme bacteria grow active and begin to reproduce. At the same time, a patient may experience physical symptoms, such as fatigue, muscle pain or headaches. Flare-ups are often triggered by stress, as in the case of Bob C. who ran a shipping department for a manufacturing company. Bob had dozens of people answering to him, but Lyme disease made him anxious and unable to concentrate. Because he couldn’t think, he lost his job, and his symptoms grew more intense. Family problems, economic changes, job loss, surgery, an auto accident, or a bad case of the flu, can send Lyme patients into a sudden tailspin. Along with antibiotics, these people need to rest—and do anything they can to lessen their emotional load. The catch-22 is that chronic Lyme disease makes it hard to think and perform one’s daily tasks. This inevitably causes financial hardship and puts a strain on family relationships. ‘My patients come in to talk about their marital problems and are surprised to learn that they are linked to an organic illness,’ says Virginia Sherr, MD, a psychiatrist who practices in eastern Pennsylvania, another region known for its high rate of tick-borne infections. Ninety percent of Sherr’s patients test positive for Lyme disease. She then has the job of describing to them just how this condition can affect the mind and the emotions. Sherr cites one devoted couple who are both infected with Lyme disease. ‘The man has major cognitive problems and the wife helps him with his memory. She has bouts of extreme impatience, yet he gently guides her through them.’ They have begun to weather the storm together—with the help of antibiotics and marriage counseling. ‘Lyme disease is like an injury of the brain,’ says Bransfield. ‘Patient are less able to think things through, and tend to act impulsively. A mother may suddenly lash out at her child and a husband may lose control and abuse his wife. We underestimate the role of infectious disease in domestic violence,’ he adds. An aggressive response is more likely if, in addition to Lyme disease, a patient has another tick-borne infection called Babesia. More than one infection can be transmitted by the same tick, and when Babesia is added to Lyme, this may make the patient more aggressive. ’It’s like putting a match to gasoline,’ Bransfield says. Schools are becoming more enlightened about the problems caused by tick-borne diseases, Raxlen notes. In Newtown, CT, for example, teachers are asked to report any sudden dips in grades or unusual behavior that may be linked to Lyme disease. And many make special arrangements for at-home tutoring while the student convalesces. When Lyme disease goes undiagnosed—or isn’t treated long enough—it can bankrupt businesses and destroy whole careers. ‘Lyme produces a microedema, or swelling in the brain,’ says Raxlen. ‘This affects your ability to process information. It’s like finding out that there’s LSD in the punch, and you’re not sure what’s going to happen next or if you’re going to be in control of your own thoughts.’ ILADS (International Lyme and Associated Diseases Society) physicians say these symptoms can be alleviated or reversed with antibiotics, but stress that Lyme disease must be diagnosed early and treated right away. Most doctors prescribe three to four weeks of antibiotics for initial cases of Lyme disease. Yet according to the ILADS, this is not enough. The Lyme bacteria has a ‘cloaking device’ that enables it to hide in the cells and body tissues. If it’s not completely eradicated, symptoms will recur and with great intensity. To avoid relapses, ILADS recommended six to eight weeks of antibiotics. When Lyme disease moves into a chronic stage, it’s more likely to lead to neurological or psychiatric conditions. Chronic Lyme patients are harder to cure and may need to take antibiotics—orally or intravenously—for months as a time. In this case, ILADS recommends continuing treatment for at least six to eight weeks after all symptoms are resolved. http://vitals.nbcnews.com/_news/2012/05/22/11811061-jpmorgan-execs-lyme-infection-spotlights-need-for-quick-treatment?lite Lyme Disease (MSIDS) is cited as a possible reason for JPMorgan Chase’s financial spiral due to an executive’s battle with it. Pathologist, Alan McDonnald also draws connections between spirochetal infection and Alzheimer’s, a disease known to cause severe cognitive and psychological issues. 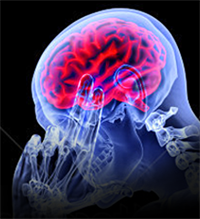 The conclusion formulated by Dr. Alan MacDonald, MD is that Alzheimer’s disease of the Subtype caused by Tertiary Neuroborreliosis demonstrates evidence by Borrelia specific DNA Probe analysis and by Microbiologic cultures of Autopsy Alzheimer’s Brain tissues producing live Borrelia in pure culture, that Alzheimer’s of the Tertiary Borreliosis type is an infectious disease. The Plaques in such cases are Borrelia biofilm communities. No one does brain autopsies and physically stains or cultures for the bacteria. Instead we have gotten lazy and cheap in our research and tried to rely on blood tests and CSF fluid to give us the answers. But those tests are wholly inadequate to detect living spirochetes sequestered inside brain cells. The trouble with silver stains is that they cannot enter human cells. So for nearly a century it was reported that spirochetes were mostly extracellular and found outside all human cells. Not only was this a wrong conclusion based on inadequate methods, but the consequences of not recognizing an intracellular infection was and still is dire. Why? Because intracellular infections can be incurable or at the very least more difficult to treat; there is almost no way to determine an end point where a bacteriological cure has been obtained. There are online support groups as well as physical support groups. Take the first step today and contact your local Lyme/MSIDS support group. You’ll be glad you did. Can ME/CFS Be Caused by Lyme?